Brian O'Kane throws his M.G. Midget round on the handbrake. At last, and for the first time in seven successive events, there has been a change in the winner’s name in an Ulster Driving Test Championship event. 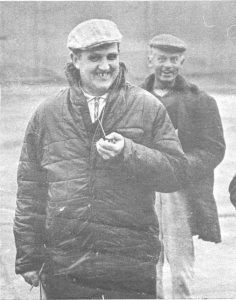 In the last six events the combination of Robert Woodside and Beach Buggy had monopolised the proceedings by winning all six. But for the penultimate round at Omagh last Friday evening, Woodside did not put in an appearance and after a splendid battle with Charlie Irwin and Roger Cree, it was Harold Hagan who came out on top with his M.G. Midget. would not get out again unless the pass was shown on leaving. On the face of it, it was very unfortunate that the evening was wet and windy and generally rather miserable. But on reflection this was maybe a blessing in disguise for the rain gave the smooth tarmac rather less “stiction” and, considering the number of reverse throws in the eight good tests, helped to avoid the possibility of any cars flattening their roofs. The proceedings were opened by the class for army vehicles — consisting of eight Land Rovers – and after they had made their cumbersome way through the tests the 24 championship contenders took to the arena. 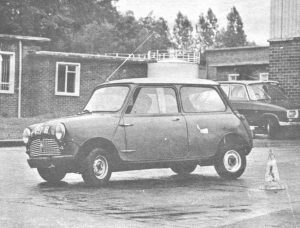 Harold Hagan got off to a flying start in test one and with 27.2 was well clear of arch rival Roger Cree’s Sprite which required 28.6, with David Grant’s Cooper S on 29.0. However Cree was not long in pulling back a second in test two -_ a rather unusual affair involving alternate handbrake and reverse throws over five lines — with Ronnie McCartney’s ‘S’ splitting the pair. 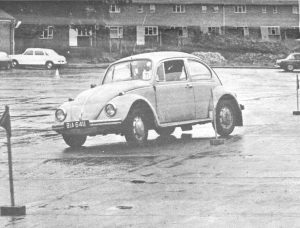 Test four involved a forward and reverse “wiggle-woggle” and Cree showed his mastery of this type of test by taking 39.8 to Hagan’s 41.2 while Ken Shields did well to take his VW through in 41.6. However he undid this good work by incurring a Fail in test five when he forgot where the finish line was. 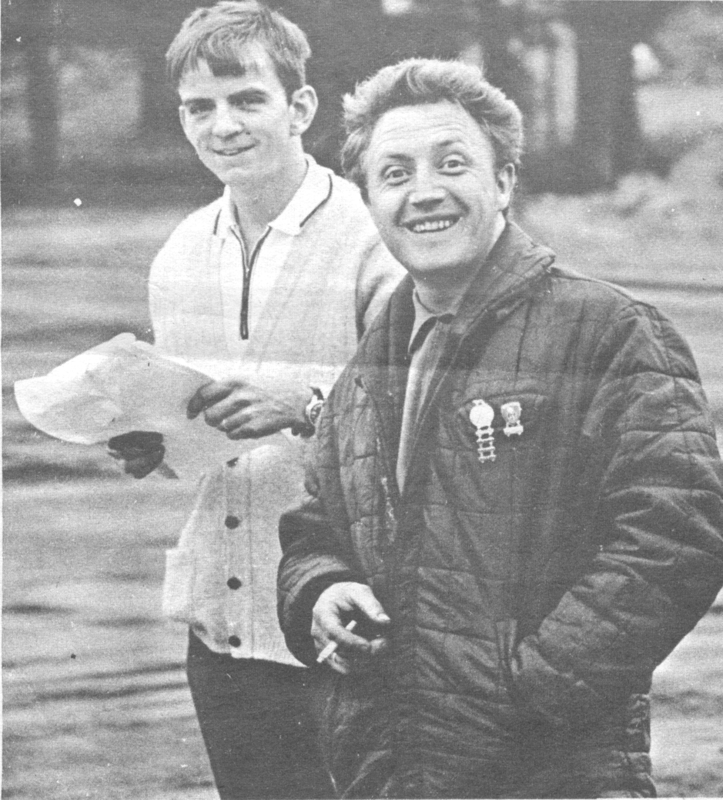 Mervyn Johnston and Ronnie Mullen (at rear) look happy as they work out how to do a test. 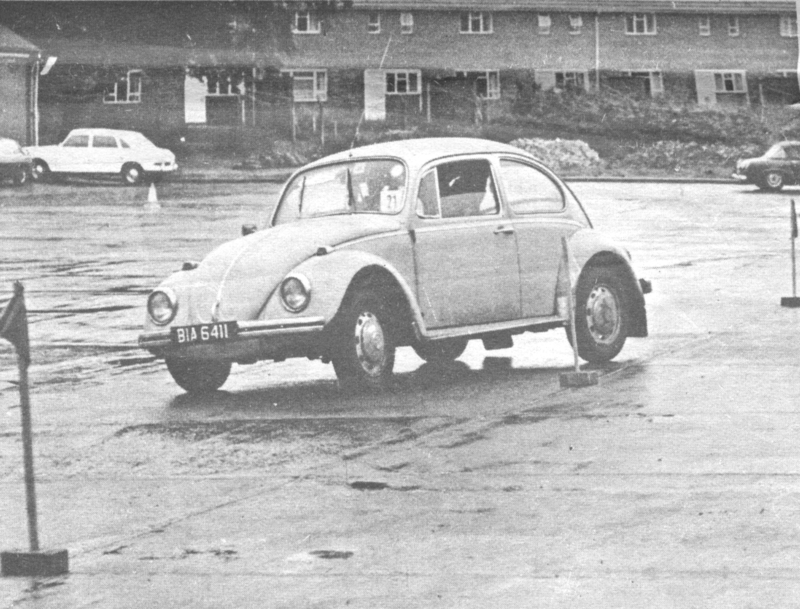 It was temporary fellow VW exponent Ron Mullen, awaiting repairs to his Cooper, who made good use of his car’s good traction in this alternate back and forward test to set FTD in 23.8, with Hagan doing 24.2 while Cree fell well back with 29.8. Hagan increased his advantage slightly in test six with 29.0 to Cree’s 29.2, but the situation was reversed in the penultimate test which was won by McCartney in 29.5 with Charlie and Ken Irwin sharing second with 30.0. Here Cree took 30.5 to Hagan’s 32.0. Nevertheless, with one test to go Hagan led the field fairly comfortable with a total of 195.4 followed by Cree with 199.1, Charlie Irwin 200.0 and Ronnie McCartney 202.4 — with the rest nowhere by comparison. But the last test was one of those nasty crowd entertaining affairs involving 360 degree turns in boxes in both forward and reverse and in which the slightest error of judgement can lead to a loss of time out of all proportion. Cree with a stupendous 46.2. Hagan was able to hold on to the lead with 48.8 — the same as Cree while McCartney was strangely subdued with 50.0. Victor Leckey takes his class winning Mini round a pylon. And that was that – Ken Irwin was fifth and the leaderboard was completed by Rowan Bell who is a relative newcomer to the driving test scene. The presence of father Artie no doubt helps to boost his confidence. Although he did not compete in the Omagh round, Robert Woodside can now be proclaimed as winner of the Ulster Driving Test Championship for the Paddy Hopkirk Trophy. After the previous round the only man with a chance of drawing level with Woodside was Ronnie McCartney but in order to do this he had to win the two final rounds while Woodside scored nothing. Well, that has not come about and Robert Woodside, unquestionably the best test driver in Europe has won the Hopkirk Trophy for the first time in its four year history, and of course this has been done in the most convincingly possible manner by winning every one of the six rounds in which he appeared in his G.P. Beach Buggy. 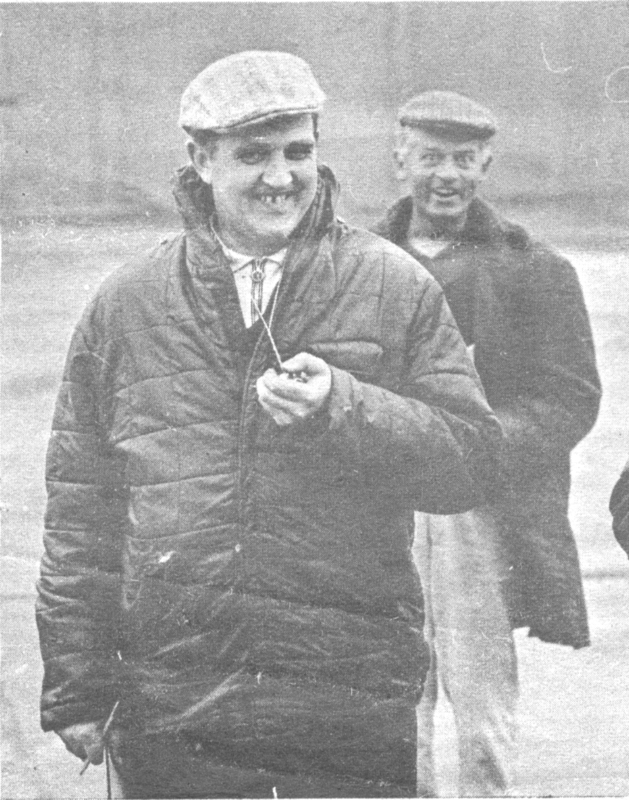 Timekeeper Harry Johnston at the ready with a surprised looking John McAleer in the background. However there is still plenty of interest in the battle for second place and this will not be resolved until the final round, organised by Larne Motor Club at Carrickfergus on September 6th. At present, Ronnie McCartney and Roger Cree are tying with 49 points, each closely trailed by Harold Hagan with 47. For McCartney the situation is not too fraught as he is easily the leading small saloon driver in the championship and the next best driver in this class, Charlie Irwin, cannot challenge him for a place on the TV Trophy driving test team which is chosen this year on the results of the championship. But the choice between Hagan and Cree is still an entirely open one and all will depend on the results of the final round. Report and Pictures by Esler Crawford. 5. K. Irwin (MG Midget) 268.8. 12 G. A. Lucas (Viva GT) 292.3. 2. E. Crawford (GP Beach Buggy) 298.6. 1. R. J. Woodside (GP Beach Buggy) 60 points. 2. R. J. McCartney (BMC Cooper S) and G. R. Cree (A.H.Sprite) 49. 4. W. H. Hagan (MG Midget) 47. 5. C. Irwin (BMC Cooper) 39. 6. W. D. C. Grant (BMC Cooper S) 27. 7. R. Mullen (Cooper S) and K. Irwin (M.G. Midget) 25. 9. I. Woodside (M.G. Midget) 19. 10 W. K. Shields (VW) 16.